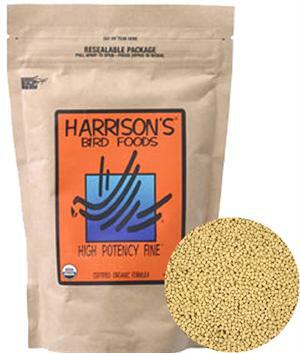 Harrison's High Potency Fine is a maximum nutritional formula for small to medium birds. Year-round diet for all small to medium parrots e.g. cockatiels, lovebirds,quakers,and ringnecks Birds may be switched to Harrison's Adult Lifetime Fine after a 6 month period. Conversion to Harrison’s Organic Bird Food: All birds should start out and remain on High Potency Formula for a period of at least 6 months. Special needs: For birds that are molting, underweight, particularly active or recovering from illness. Weaning Birds: Feed High Potency Formula for at least 6-9 months. Supplement weaning babies with vegetables and fruits e.g. orange/dark yellow or dark green leafy items such as sweet potatoes, carrots, pumpkin, winter squash, broccoli, spinach, mango or papaya. Breeding Birds: Birds should be fed High Potency Diet 1-2 months prior to the breeding period and until chicks are weaned or for at least six months before resuming Harrison’s Adult Lifetime Fine. Replenish food daily, do not “top off”. Reduce waste by feeding as distinct meals. Feed Harrison's Adult Lifetime Course free choice. Suggested for cockatiels, lovebirds, parrotlets, quakers, ringnecks and other similar birds.